Due to some crazy deadlines and loads to do at work, I’m struggling a bit to update this as regularly as I’d like. However, I’m shamelessly hoping that I can placate you with a bribe in the form of some photos from Venice and Paris. This is an assortment of doorways, alleys, street art and other tid-bits unsuitable for a general gallery of travel photos. Some political signage in Venice. Alleyway in Venice. One of many thousands. 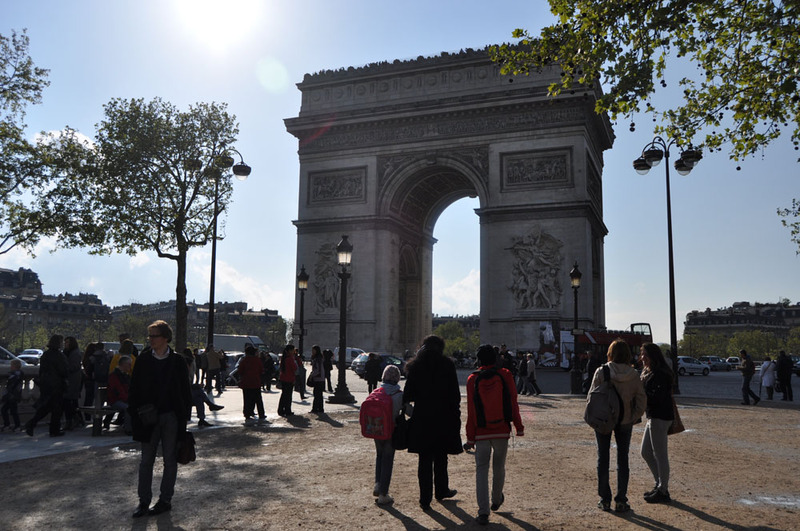 Our plan for the day is to visit a rather vast area riddled with tourist attractions in the 7th and 17th arrondissements of Paris. 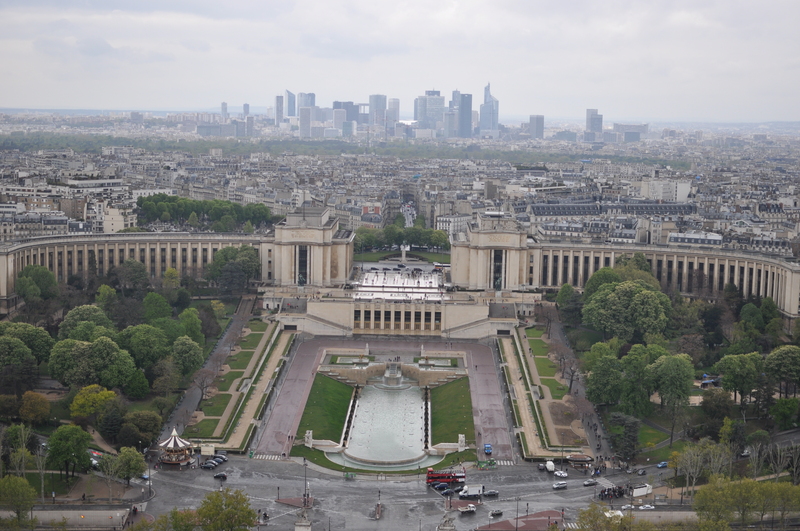 These include the École Militaire, the Champs-Élysées, the Champ de Mars and a trip up the Eiffel Tower. I’ve found Tripomatic an invaluable asset in planning what to see in our unknown destinations, and would highly recommend it! 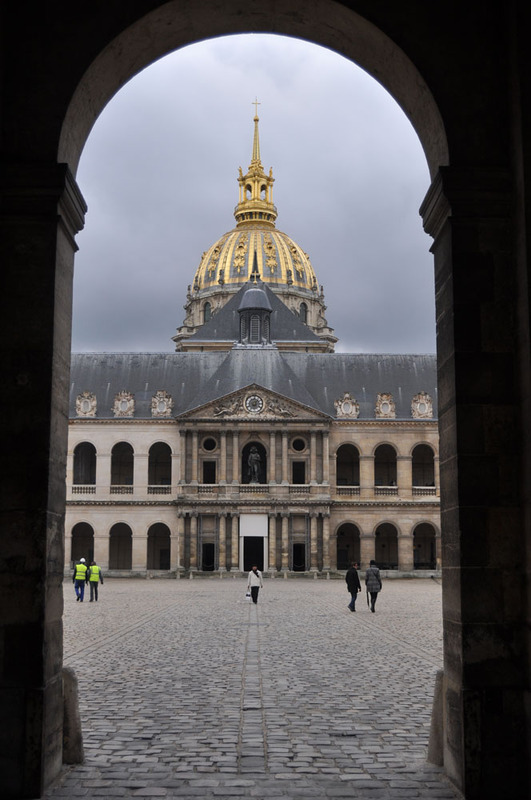 The first stop on our tour (no matter what that plan may say) is the House of the Invalids. We chose a Metro stop on the far end of the Ponte Alexander bridge and the view is stunning walking over it. 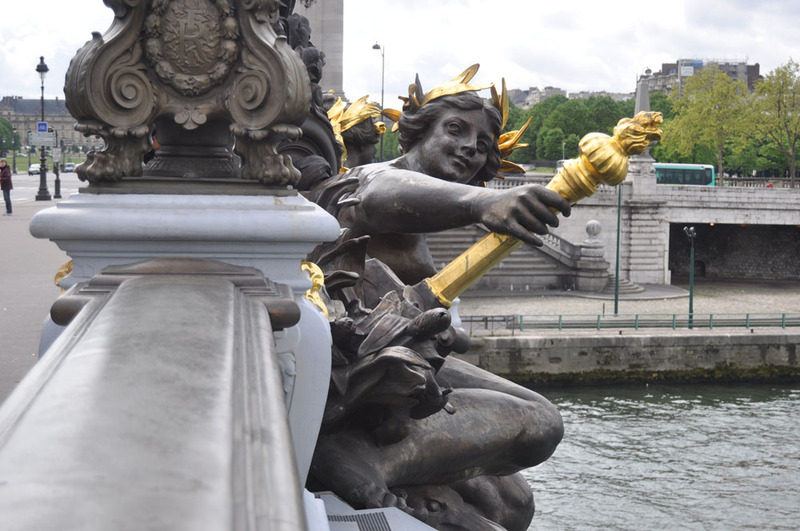 The bridge is one of the oldest in Paris and is adorned with quite a few wonderful details. 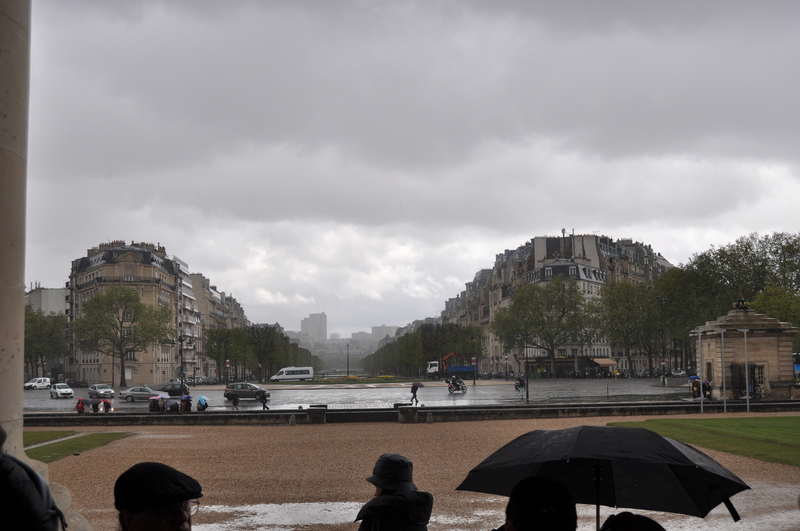 It seems as soon as we arrive at Les Invalides it starts pouring down with rain again. We meander around the courtyard looking at the displays of canons and the like whilst keeping out of the rain as best we can, though after three weeks of constant rain I have to admit that I’m no longer feeling the love. Together with a gaggle of other tourists, we spend the next 40 minutes or so hiding our in an alcove. At this stage it seems abundantly clear that the skies won’t be relenting their watery assault any time soon, so we make the tough decision to go back to the hotel and have lunch. The rain has been somewhat like a toddler with a light switch, and the constant on-off on-off of the torrential downpour has at least been constant in its unpredictability. It has now become clear that our already short-listed version of the sights we want to see in Paris, will have to be cut again and again in order to fit in with the weather’s schedule. 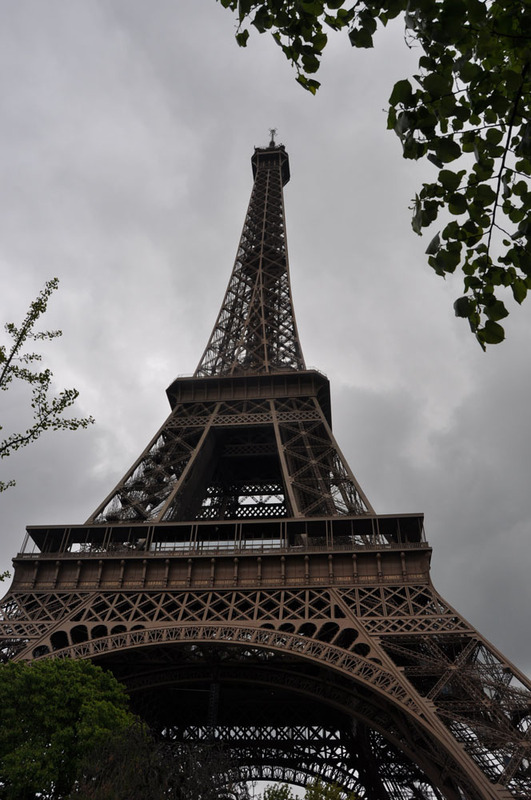 During another dry spell we grab the opportunity to visit the Eiffel Tower. Instead of leisurely strolling through the surrounds, we act like true tourists and take the Metro to the closest stop to the tower and get in line straight away. Through some fluke we end up buying 2/3 tickets, meaning we have to climb the first two levels of stairs before we can take the elevator to the third level. Though the views are amazing and it’s a rather nice experience, the wind is biting and horrible as one ascends. The view from the top is amazing. 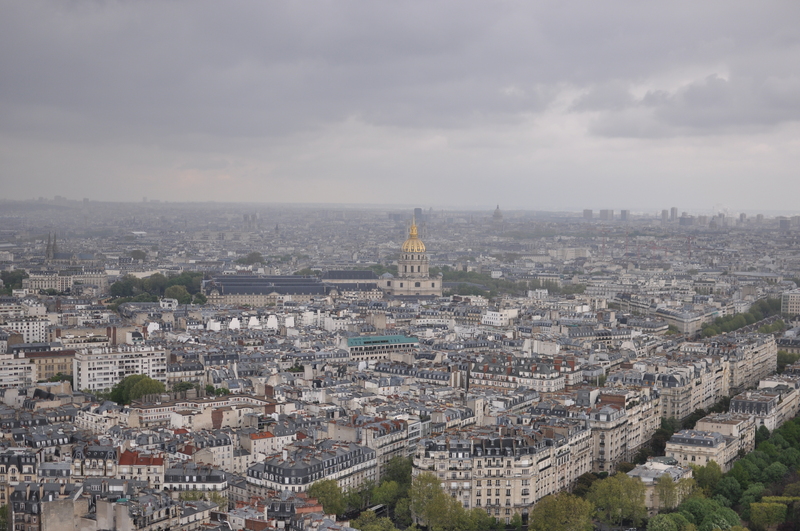 The only hill in Paris proudly boasts the Sacré-Coeur and the Louvre is clearly visible. Having studied the lay-out religiously in preparation of our visit tomorrow, this offers an amazing bird’s eye view. 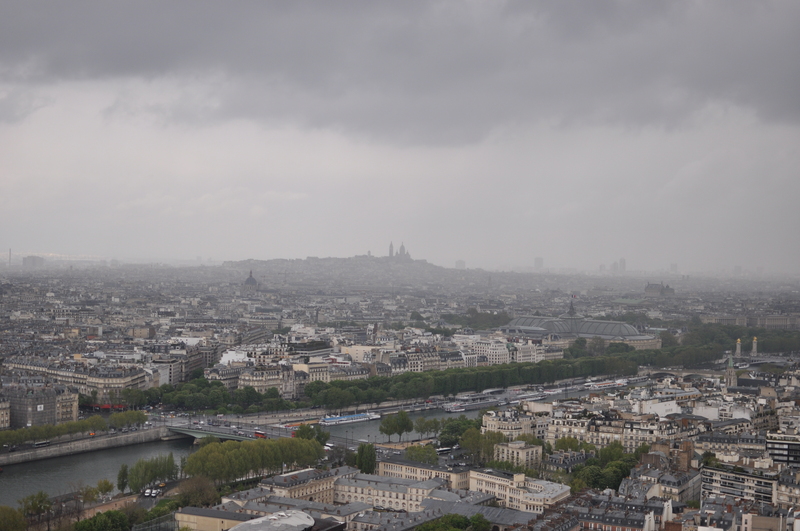 In the distance the Arc de Triomphe is visible with its adornment of crazy traffic, but over it all lies a bank of cloud threatening everyone with its seemingly ever-present gloom. After descending the steps and reaching ground level, Francois requests that we take a stroll down the Champs-Élysée, at least for a while before we get wet again. 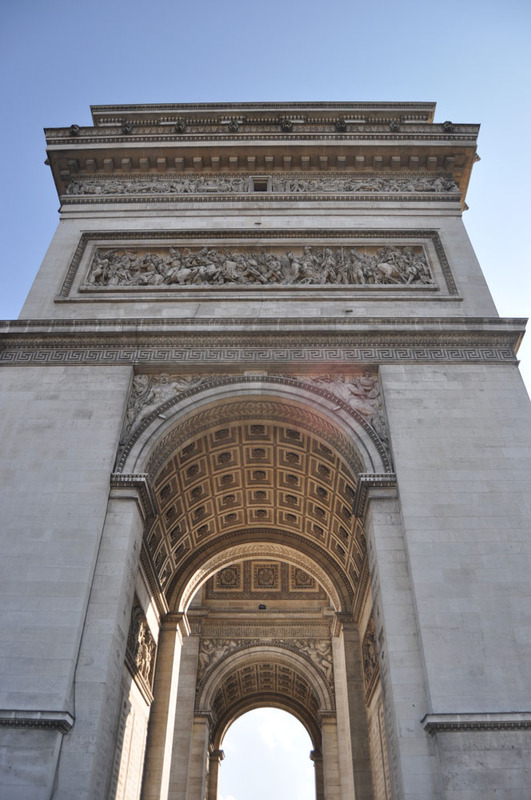 The gardens are beautifully kept and it’s a great experience walking down these well-worn stones, but in the light of wanting to save some time we find the next Metro stop and head to the Arc de Triomphe, as the rain is holding out on us for the moment. Knowing that I may be judged severely for this, I have to admit that the arch itself is not all I expected it to be. The symbolism is great and the detail on the structure itself fascinating, but as a whole I felt rather underwhelmed. As far as unique experiences go, the arch itself doesn’t make it to my list of top 10s. However, while we were standing around looking at the traffic and being told to stay away from the arch, it seems that some military procession was taking place and we were caught up in the middle of it. This did make up for the lack of great weather a bit! After our long day of (mis-)adventure, our final stop for the day is meant to be the restaurant we found in Montmartre last night. We get dressed in our finest, non-tourist garb and settle in for a wonderful meal of foie gras, duck and chocolate fondant. The service is impeccable and the wine lovely, perhaps all the more so because of the beautiful setting. After dinner we realize that we may still catch the 23:00 light show on the Tour de Eiffel is we hurry, and as the weather is behaving we take the longer route across the Champ de Mars towards the tower. The lights start twinkling as we walk hand-in-hand towards the tower and I have to admit, that it is every bit as wonderful, romantic and clichéd as one could ever imagine. The perfect ending to a less-than-perfect day. Next: a day at the Louvre.